Presented at the discussion panel on Philosophy and Literature at the XXIV World Congress of Philosophy in Beijing, China on August 14, 2018. Subjectively, we experience moods in seemingly thousands of different shades. Currently, we have no model for describing their variety. 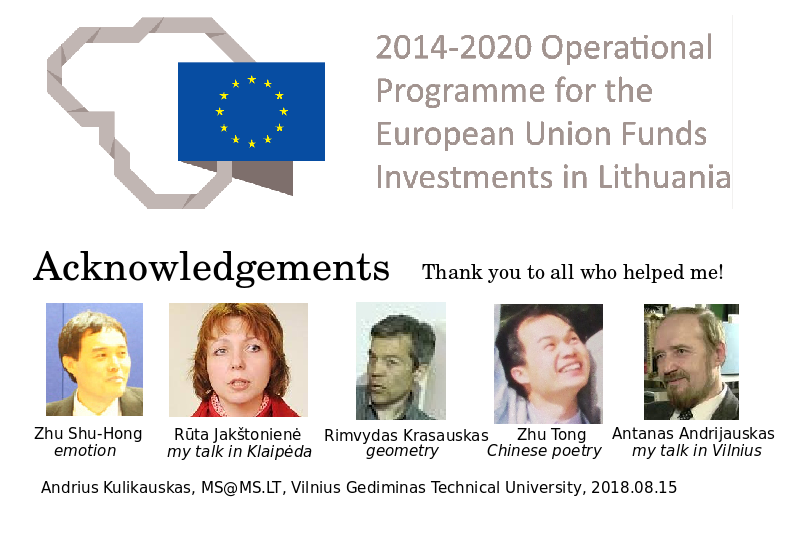 (Ekkekakis, 2013) I sketch a research program of our personal moods to identify, reproduce, contrast, transform, interpret and appreciate them so that we might understand and share them just as we do any language. 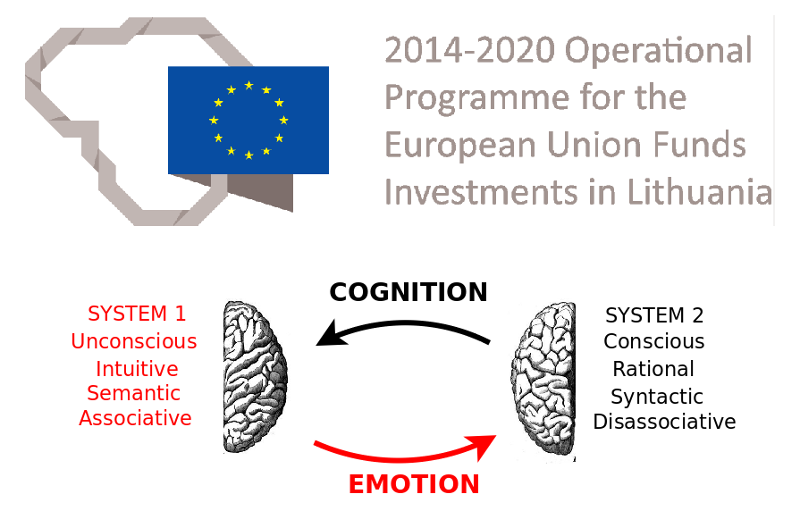 A first step is to model our most basic emotional responses. 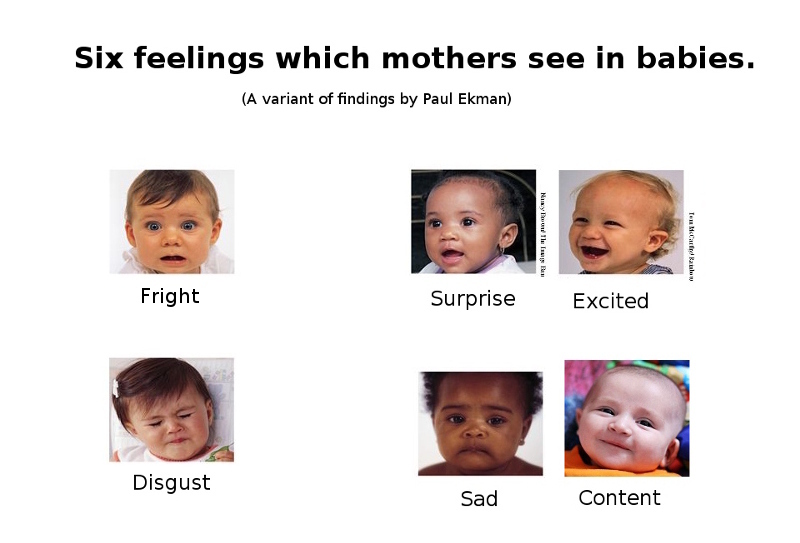 I started with six responses which are essentially those which psychologists Paul Ekman and Harriet Oster found can be observed in the faces of young infants, namely: happiness, sadness, excitement, surprise, fright and disgust. (Oster & Ekman, 1978) What is the simplest way that I might evoke these responses within myself? I once read that we are struck by existential sadness when our deeply held assumptions turn out to be wrong. So I imagined myself as a child playing with alphabet blocks. I would pick up a block, guess what letter was on the other side, and see if I was right. 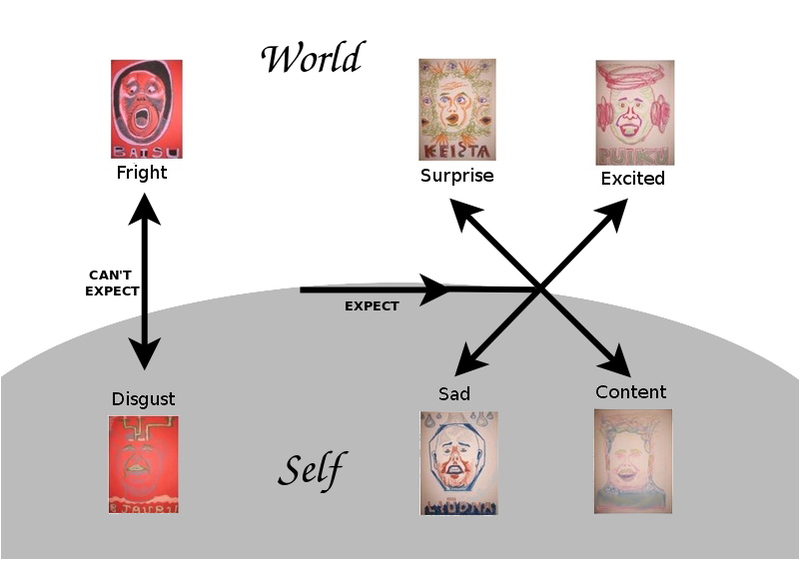 We can thus evoke distinct, basic, pure, vivid emotional responses by manipulating abstract expectations. It is remarkable that psychologists have not appreciated the significance of our imagination's ability to evoke feelings. 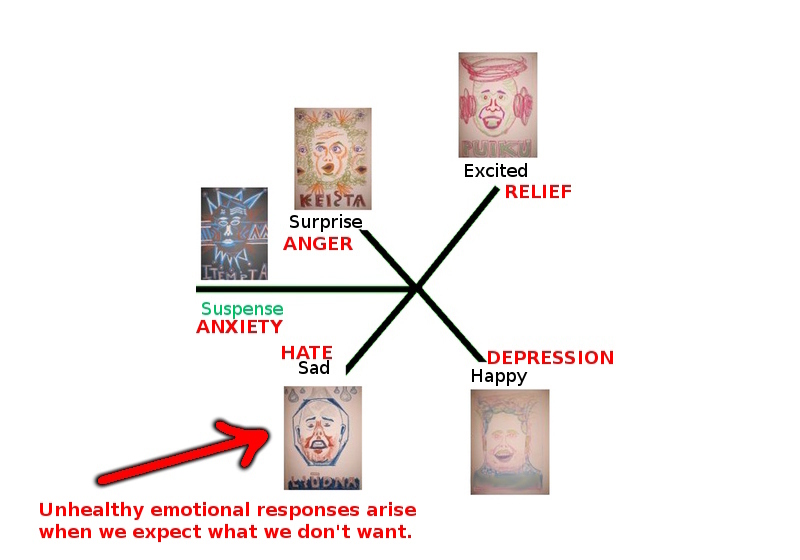 They focus on physiology and conclude that there are no basic emotions, indeed, no reproducible emotions, because they lack any consistent expression. (Barrett, 2017) It is as if they were linguists for whom shouting and whispering were different activities and who never understood that they may convey the same name. They do not appreciate the mind as an abstract system of activity which maintains a coherence that need not have any particular neurological analogue. 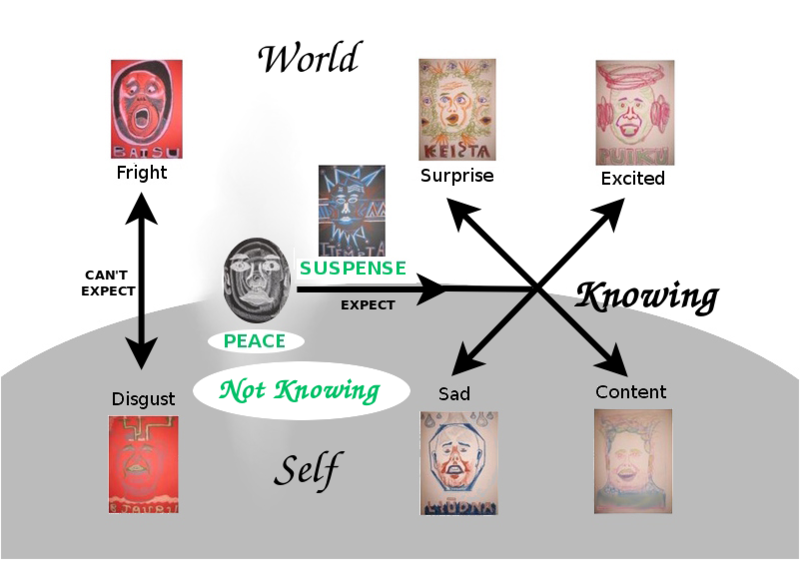 Proceeding similarly, we can show how to evoke other feelings including fright and disgust; suspense and peace; anxiety, anger and hate, relief and depression; beauty, intimacy and love; humility and resignation, guilt and shame, self-assurance and pride; empathy and humor; pleasure and pain. Negative moral tones arise when we expect that which we do not wish. For example, if I expected to find my bicycle where I left it, then I will be surprised if I don't; but if I expected it to be stolen, then I will be angry if it is, but relieved if it is not. We feel positive moral tones as the impossibility of negative moral tones. 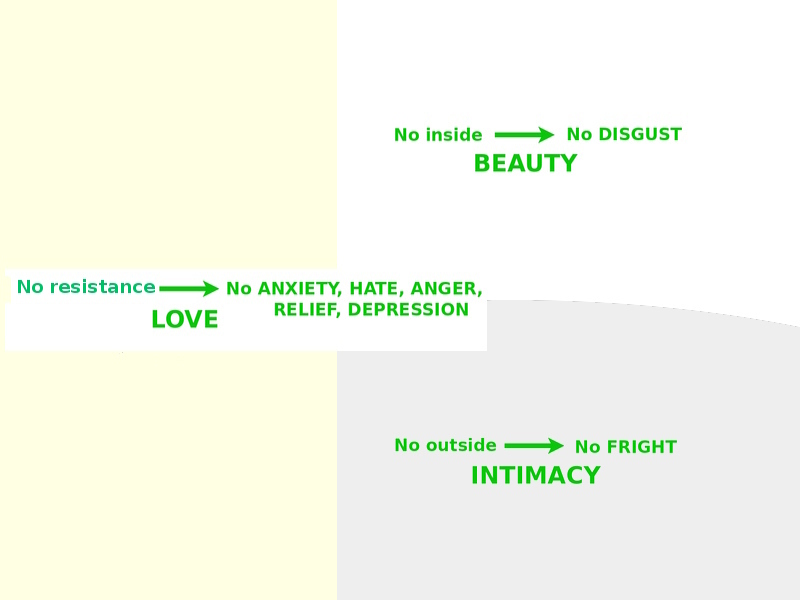 For example, if we perceive that everything is outside of us, then disgust is impossible, and so we feel beauty. Thus we feel beauty not as our own emotional response, but rather as an afterglow, emanating from our beautiful environment. Bed. Beyond, bright moon shines. Seems like on the ground is frost. I raise my head - see bright moon. 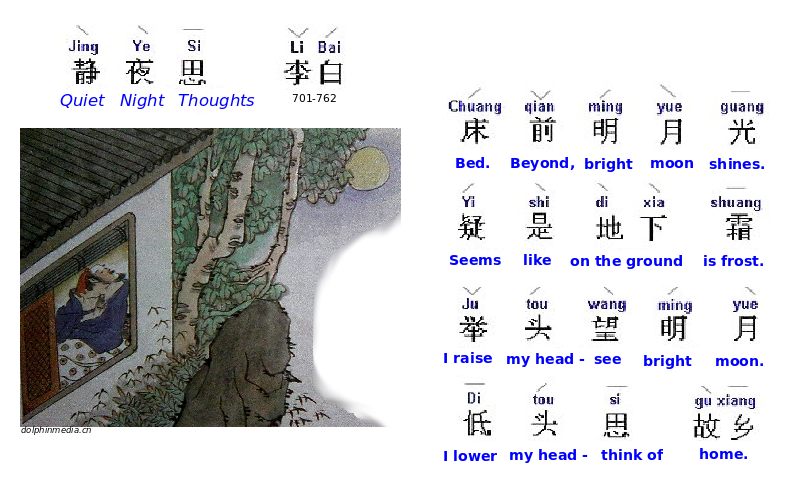 I made a study of 37 classic wŭjué poems (five-character quatrains) from the reknowned collection "Three Hundred Tang Poems" (Tángshī sānbǎi shǒu). (Bynner Jiang, 1972) Each poem made use of one of six different transformations of the boundary that defines the self and world which are familiar to geometers: reflection, shear, rotation, dilation, squeeze and translation. 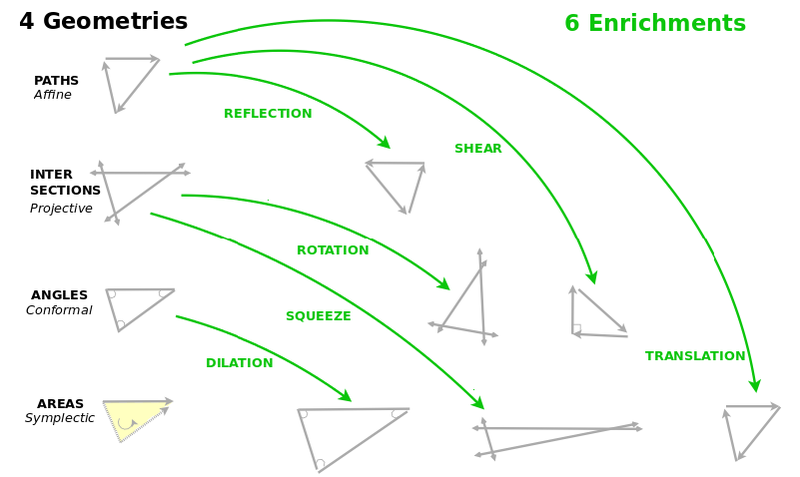 These transformations are six ways of enriching a geometry. In the simplest affine geometry, a triangle consists of three paths from A to B to C. In a projective geometry, it consists of lines intersecting at A and B and C. Lines moving back and forth allow us to confront our own moods. In a conformal geometry, it is formed by angles at A and B and C. This lets us admit of other moods, perpendicular with ours or not. And in a symplectic geometry, it is an oriented area defined by A and B and C. Here we may attribute a mood to our environment. A reflection allows us to look back upon ourselves. A shear transformation lets our view be perpendicular to that of another who sees what we don't see. 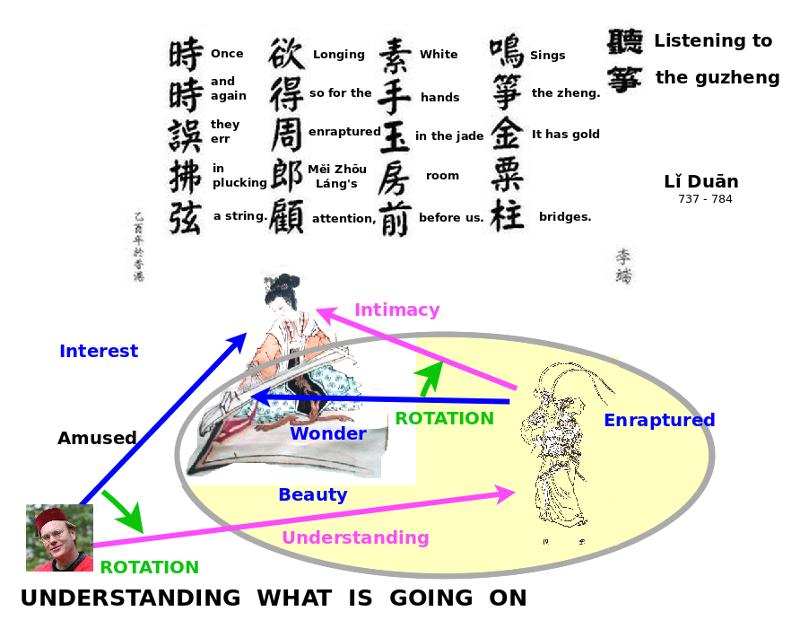 A rotation lets our view dance from point to point. A dilation has our view expand it, whereas a squeeze transformation has it keep the same area but recast the proportions of its shape. A translation has us move to a new situation. I simply wish to suggest that conceptual geometry is the key to an interpretation of the situations which define the boundary between our selves and our world which determines our mood. 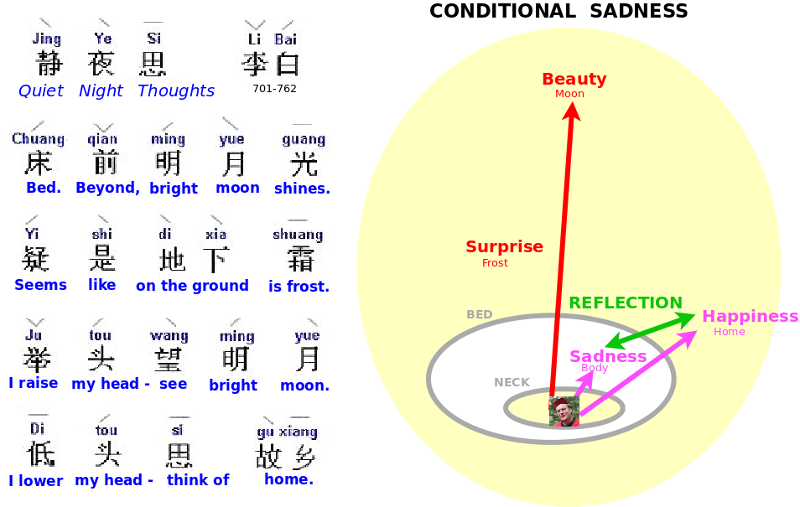 7 poems establish a mood by reflection. I see myself, as if in a mirror, in a foreign world: I talk up a boatsman, whether he's from my village; in my dashing enemy I perceive my own ambitions. In Li Bai's poem, Quiet Night Thoughts, his bed marks the boundary between familiar and foreign. 4 poems establish a mood by a shear transformation, that is, by defining perpendicularity: flowers bloom apart from us; I awoke to realize I had slept through a passing storm; one must comport oneself anew after inauspicious omens; venerable ladies discuss the absent Emperor. 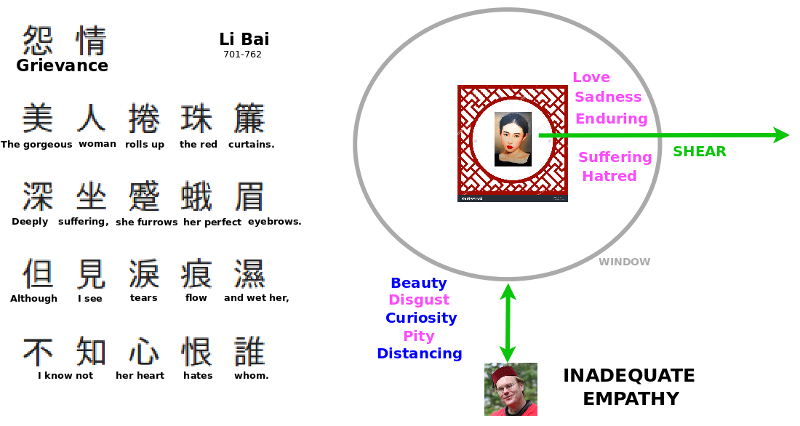 In Li Bai's poem, Grievance, an injured beauty opens her window, but I remain disengaged. 5 poems establish a mood by rotation, turning our attention. A sensitive friend, however far away, will hear the falling of the pine cone, which I hear in the stillness of the mountains. The buddy at my side may succumb to temptation to drink a cup of wine. A general will shoot an arrow blindly into the storm and, in the morning, find it driven into a stone. In Li Duan's poem, Listening to the Guzheng, the harpist commands not only of the warrior's attention, but mine own, as well. 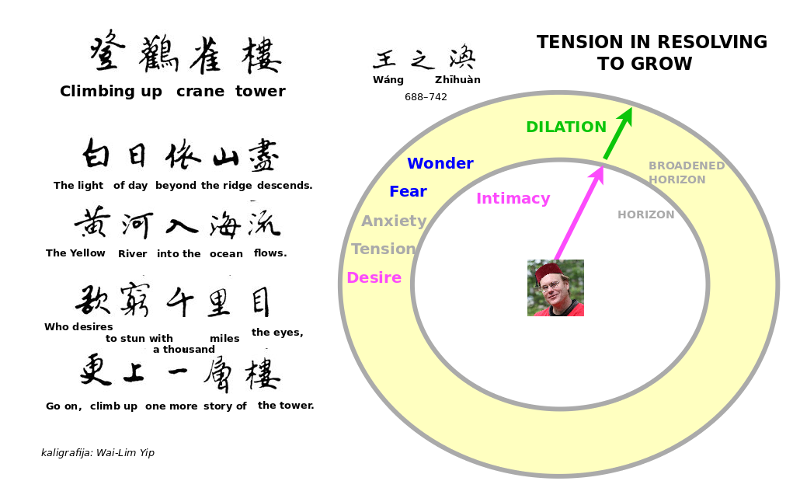 7 poems establish a mood by dilation, that is, by increasing or decreasing scope. That is our relationship with our environment and its mood. Mountains and paths are snowed over, as if there were no boundaries, and yet we see a fisherman, all alone, in his small boat, covered by his bamboo coat, his personal boundary. Stopping at the edge of the wilderness, as the plains open up, a traveler is overcome by sadness, he feels himself too large, but then the moon draws near, reflected in the creek. (This is an example of how one transformation may be extended by another, even in a short poem.) Wang Zhihuan's poem, Climbing Up Crane Tower, widens endlessness, as you imagine climbing one more flight of stairs. 9 poems establish a mood by a squeeze transformation, whereby an area remains constant but its proportions change. Similarly, a poem may relate a general's silk flag with a thousand shouts from the tents. Li Yi's poem, Jiangnan River Song, considers is a wife better off with an inattentive merchant or a commoner who is regular as the tides. 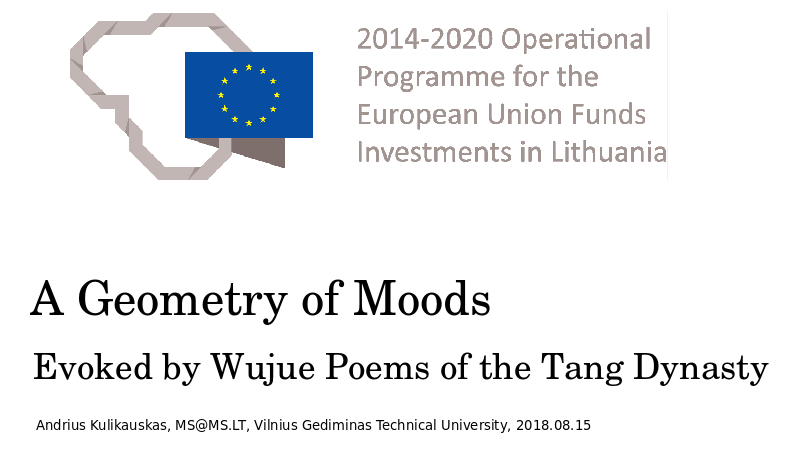 6 poems establish a mood by translation. The elder dame of the estate comes to tears from hearing a song of her homeland. 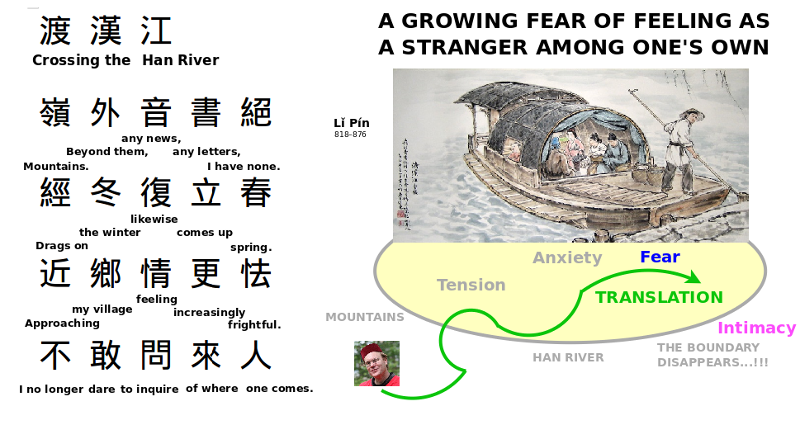 Li Pin feels a growing fear, as he gets closer to home, that he will feel a stranger there, in his poem, Crossing the Han River. All 37 poems nicely distributed themselves according to these six geometrical transformations. This suggests that spatial relations are the key to the mood which a poem establishes. And the purpose of that mood and of the poem, I believe, is to foster our growth to empathize with others, to know ourselves, and to develop commonality. Classic poems let us believe that they can indeed evoke in us specific, comparable, well defined moods. Working further, we may truly externalize this internal language of moods. Thank you to Sylvain Poirier for his online notes about geometry from which I made use of the six transformations he described.